Professional bulk SMS Software offers cost-effective and easy way for sending bulk text messages via GSM or Windows based mobiles. Mass text messaging program provides facility to send thousands of text SMS simultaneously from computer or laptop machine to multiple mobile users using GSM or Windows based mobiles. Professional bulk text messaging application provides facility to send national or international SMS from computer system to any other mobile phone. Group SMS software sends text alerts notifications from PC to any other cell phone without any internet gateway. 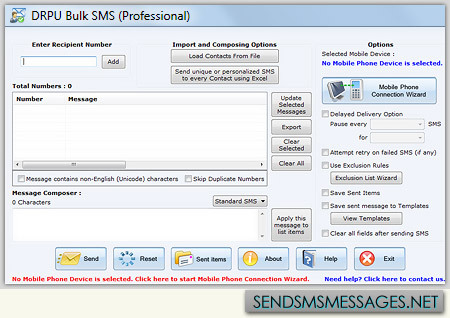 Bulk SMS software provides delay delivery feature to manage load of bulk SMS broadcasting. Professional bulk SMS software delivers standard SMS as well as notifications with full support to all mobile phone networks. Helps you to connect with people via sending bulk messages. Provides most affordable way to communicate with people. Helps you to market your product and increase sales and revenue. Helps you to drives customers towards your business. Does not require internet connection to send text messages. Delivers worldwide text messages from computer system. Provides reliable and quick delivery of global text messages. Bulk SMS application supports all mobile phone networks. Allows user to communicate with people via broadcasting text messages. Easily works on entire GSM technology based as well as Windows mobiles. Supports different Unicode languages for sending bulk SMS in any text format. Provides facility for sending multiple text messages using delay delivery option to control the load of bulk SMS broadcasting. Has inbuilt list wizard option to maintain list of contacts or groups which many need during the message sending process. Provides facility to load contact numbers from phone memory while using Windows based mobiles. Provides facility to send standard messages or notification. Allows user to save sent messages to templates. Compatible with all Windows mobiles as well as GSM technology based mobiles phones.